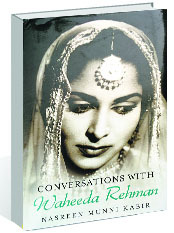 Exceedingly charming, candid, humourous and disarmingly honest Waheeda’s conversation unfolds the eventful life she has lived with élan and style. Told retrospectively, Waheeda puts in perspective, what must have been major upheavals in her life, when she lost her parents early in life and then became the toast of tinsel town before she was out of her teens. Kabir does her bit by directing the conversations in avenues that lead to interesting and introspective narratives of times and people bygone; but still vibrant and alive because they are so much a part of public memory. The book took two years of conversations, and Kabir must have done some pretty smart editing because nowhere does she allow it to get either maudlin or rambling. However, it's a graceful piece of writing as she lets Waheeda set her own pace. Waheeda Rehman is a real lady. Not that anyone had any doubts about that- not even when she was playing Hira Bai, a travelling courtesan in Teesri Kasam. But make no mistake; her manners may be a throwback to a more polite era, but her sensibility is as modern as any young person of today. The Waheeda stubbornness manifested itself quite early in her professional career, when she refused to change her name to a more acceptable, and supposedly sexier, one than her own. When it was pointed out that stalwarts like Meena Kumari, Dilip Kumar, Nargis, everyone had adopted a new screen name, this newcomer declared, "I am not everybody!' And she was not. She even insisted on a clause that would give her the right to decide what clothes to wear or not for her films. Until today, she has not worn even a sleeveless dress. And she is still considered one of the most desirable women of all times. Naturally, what the reader seeks most is to understand the relationship between Waheeda and Guru Dutt, the person who "discovered" her for Hindi films and shaped her destiny, but though she talks candidly of their professional association, she evades any discussions of a personal relationship. In one interview, she said: "… I strongly believe my private life should remain private. What ultimately matters and concerns the world is the work we leave behind." Waheeda, however, speaks candidly about her professional life and how she gave it all up one day to move to her farm in Bangalore with her husband, Kamaljeet Rekhi, and her two small children. Reading the book is like looking at an old family album with pictures of familiar family members (in this case, cine stars) popping up to create reminiscent moments for the reader. The pictures add to the nostalgia. Interaction with Raj Kapoor, Dev Anand, Satyjit Ray, Raj Khosla, Sunil Dutt, Nargis dot the book and the reader gets vignettes of episodes in the lives of these legends that one would have been otherwise deprived of. Waheeda's enduring friendship with Nanda, with whom she had been friends for 55 years ever since they worked together in Vijay Anand's Kala Bazaar even impacted the release date of this book when her dear friend passed away. Films enthusiasts will love the small stories behind the making of famous films. Gulaabo, Shanti and Rosie — Waheeda Rehman is all these enigmatic and beautiful women rolled into one. Are they extensions of her or is she a manifestation of them is a question that remains unanswered. So practical at one moment and so unfathomable the next — Waheeda is delightful and still keeps us guessing and asking for more.